July was not the most pleasant month weather-wise, with four 100-degree days and a lot of sweltering heat during the second half of the month. But it sure ended nicely, with high temperatures in the 80s on Tuesday, with widespread rainfall of 0.5 to 1.5 inches providing some respite for area trees and lawns, and clearing skies in time for sunset. Moreover, the weak front that precipitated the showers left us with drier, cooler weather this morning, with lows in the upper 60s for northern areas of the region. However, we have now come to August, which means we’ve reached the busiest eight-week stretch of hurricane season for the Texas coast. 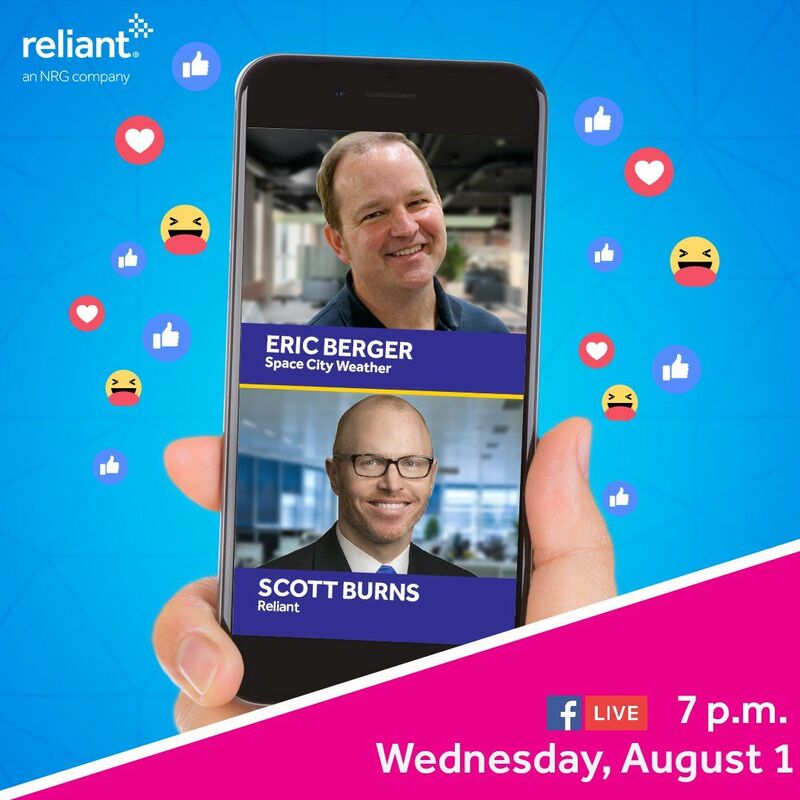 I’ll have an updated outlook for the season in Thursday’s post, and don’t forget to tune in tonight at 7pm on Facebook Live as I team up with Reliant to talk about hurricane season, summer weather and more. At this time there is no cause for alarm, of course, but it is always a good idea to be prepared along the Gulf coast at this time of year. Now, onto the forecast. 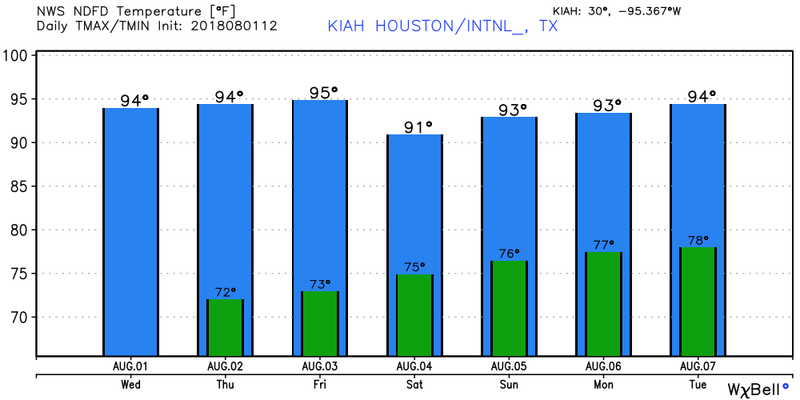 For August, conditions will be reasonable in Houston the next two days due to some modestly drier air that accompanied Tuesday’s front. Skies will be mostly sunny, with highs in the mid-90s. But mornings and evenings will be decent, with lows generally into the low- to mid-70s across the region (cooler inland, of course, and warmer near the coast). Along with slightly warmer humidity, this is fine weather for August. By the end of the work week, moisture levels and humidity will be trending up. While we can’t entirely rule out a few showers, most likely the region will just see sunshine, and highs in the mid-90s. As we’ve been suggesting for awhile, there’s the potential for rain this weekend, as high pressure moves out of the area. Right now I don’t think we’re looking at accumulations like we saw on Tuesday. Rather, I think the showers will be scattered in nature, with partly sunny skies and highs in the lower 90s. Saturday will probably see a slightly better chance of rain, but at this point we’re really splitting hairs. A chance of light to moderate showers should hang around for most of next week, with enough moisture, and a fair amount of clouds. Thus, the first week of August could end up seeing slightly cooler than normal temperatures, which is just fine with me. I really enjoyed your presentation yesterday at the EM Campus. Thank you for taking some time out of your busy day and providing some insightful information into the world of forecasting! I was leaving for work this morning this August 1st and wondering if I was in Houston or Nashville. Good work on the weather today, keep it up. Maybe you can make October come early? Hoping for more this weekend. Loving the cooler temps! Love reading these morning updates! 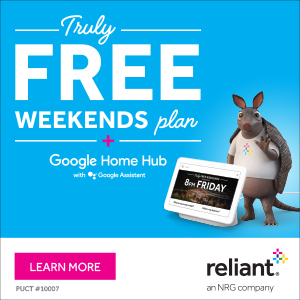 We have a pool party planned for 12-2 PM on Saturday in Katy. How high are the chances that this will be rained out? Wondering if we should move to Sunday instead! I would not move it. There is pretty much an equal chance of light (thunderstorms very unlikely) rain on both days. I’m going to be in Brazil for the next 10 days and am feeling anxious about hurricanes post Harvey. Any chance of a surprise one cropping up here in the next week? Thanks for all the information Eric & Matt. 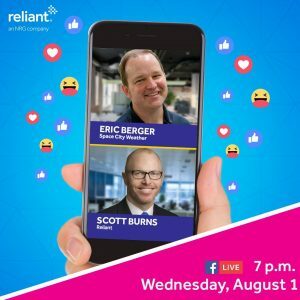 Is there a chance you could address Houston’s air quality issues? Would love to hear this too! We think my husband may have gotten viral bronchitis from the African dust? He has asthma. Still hasn’t recovered! The dust is pretty much gone for now. It could make a modest comeback by the middle of next week. I’m less interested in the dust and why it seems like we’ve had more ozone action days this summer than in the previous 5 years I’ve been here. What’s causing that?